The roof of the shallow sea was rough and laced with stringers of foam. A terrible storm raged in the mysterious ‘above.’ Tremendous winds pushed the water, like it was trying to force the air deep enough to reach the white seafloor covered with all manner of creatures, living and dead. Storms seasonally swept through the continental sea, wreaking havoc on anything floating, swimming or lying on the bottom. Most plants and animals could sense changes in the pressure and had prepared themselves. Bobbing along furiously was Tentacles, a small creature with dozens of leathery appendages with numerous muscular ridges. She tried to keep her shell vertical in the water, they way she always swam. Yet, it was a mighty struggle as the storm-induced currents lashed her from all sides. Every time she tried to turn into the flow, the current would change direction and she’d start to spin dizzily. She was young and had never before experienced something this horrible! Tentacles lived within a coiled shell that was white, dappled with blue-gray and brown camouflage splotches. Her shell was special, not dull and simple like her distant cousin, the snail. It was divided by walls into chambers; each had a little perforation so she could control her buoyancy. On a whim, she could fill the chambers with gas causing the shell to rise. Or she could push the gas out by adding sea water which increased her density so she could sink toward the bottom. At the moment she was filled with a combination of panic and confusion. Her instinct for self-preservation was still being perfected. To the left and right, she had large eyes with slit-like pupils. Her vision wasn’t great, but served her well enough. She knew how to keep an eye out for predators – the rare fish or larger versions of herself. But the storm was an invisible predator. Tentacles didn’t understand the signals: the sky darkening the sun, the bright flashes of lightning above, the deepening waves on the roof of her world, whereas most other creatures had recognized them. She would not be caught out in the open the next time a storm appeared! During a lull between giant crashing waves, the sea became calm enough for her to breath in water to fill her chambers, and exhale a jet through her siphon to shoot downward. With every meter farther from the deadly surface, the strength of the currents battering her shell became less terrifying. She zigged and zagged, looking from her left eye, then right in the direction she was moving. Looking down, Tentacles saw a shoal of brachiopod shells mixed with fans of lacy bryozoans, but they offered no measure of safety against the storm. The empty shells were tumbling with the force of each wave above, mixing with lime mud giving the seafloor a milky wash. If she tried to shelter here, she might be pounded by a rolling piece of coral that would crack her beautiful shell. No, she would have to find someplace that was protected. Muscles repeatedly pulsed water through her nostril-shaped siphon. The inward flow gave her necessary oxygen. The outward flow acted like jet propulsion and moved her backward. She struggled to stay high above the dangerous debris stirred up by the storm, but low enough to keep from being pulled in random directions by the fickle storm currents. She caught a dark silhouette to one side and twisted to get a better view. Ah! What’s that? It looked like a small rise in the distance. She moved as smoothly as the rough conditions allowed until it resolved into a large coral colony. The shape was like a large saucer with hundreds of long tube-shaped polyps radiating outward. There was just enough space… Yes! She could get on the leeward side of the coral head where the ocean currents were blocked. Safely hidden between shell-gravel and the bone-like coral, she breathed slower, taking in the oxygen-rich water through her gills. Her eyes adjusted to the darkness of the colony’s shadow – deepened by the ominously dark clouds in the ‘above.’ Resting comfortably for the first time in ages, she detected the slow movement of a small snail crawling on its tasty foot muscle across a fragment of bryozoan. She twisted slightly and stretched out two of her arms. Nimbly, she wrapped around the morsel and pulled it up to her beak. The horn-like jaws crushed the shell easily and she had her first snack of the day. Most of her food was creatures that lived on the seafloor, though as she grew larger, she would be able to ambush prey that drifted on the currents. It triggered her appetite, so she carefully moved around looking for more live prey. A small trilobite darted out from under a flat brachiopod shell. Her tentacles snapped out after it. Ummm! Yummy! She dared not go out of her coral shelter. While the storm pummeled her surroundings, she felt safe enough to fall asleep. She wrapped her longest leathery arm around a piece of rock sticking out of the mud to keep from drifting away. When she woke up, she was startled by the presence of another creature. It was like looking into the reflection from the surface of her sea. Cautiously, her other long arm reached out to get a feel her neighbor. It had a coiled shell that was the same size and shape of hers. The mottling pattern was similar. When she touched it, the other startled and turned its lensless eyes in her direction. The rings of numerous ribbed tentacles had been retracted until she surprised it with her own touch. It had a familiar scent. Perhaps it was a long-lost brother or sister? She had no lost love for the intruder. It seemed intimidated by her presence, making no aggressive moves – even backing away a few inches. She returned to her previous spot under the coral and retracted her own tentacles. Sleepiness washed over her as she kept one eye on her neighbor. They both dozed as the storm continued unabated around them. When Tentacles awoke, the ocean felt different. It was quiet and peaceful. The light filtering down from the waves was muted, but not threatening. Her temporary companion was gone. She ventured out from the safety of the coral colony. Rising above it, she saw the polyps were open, their long jelly-like tentacles flicked lazily back and forth, matching the rhythm of the calmer currents. By instinct, she knew to keep away from them. While her arms could grab hold of prey and pull it in toward her mouth, the corals had tentacles that stung! They could paralyze and kill just by brushing against them. With a jet of water from her siphon, she moved to a safe distance. Her poorly-developed eyes couldn’t pick up the pink clouds from the sunset. They opened wide, but didn’t have sensitivity to color. Returning to the bottom, hunger gnawed, so she began a relentless search for dinner. Brachiopods had little nutritional value with so little meat in the shell. They could be eaten in a pinch, but she wasn’t that desperate. Not yet. She knew where snaily morsels could be found and swam in that direction, poking and prodding in the detritus of the bottom along the way. Lots of other creatures that had to hold tight or hide during the storm were also hungry. She snapped up a tubeworm here, tried to yank out a clam there as she worked toward a large rocky mound coated with green hair-like algae as well as brown and purple fronds, swaying in the currents. The pickings were good. She grabbed the first snail she found browsing on the seaweed. Its shell was almost as big as hers. It wouldn’t release its grip from the rock, so she snipped at the shell with her hard beak. Success! The soft, tasty meat inside was hers to enjoy. Tentacles dined peacefully for a while on the assortment of mollusks that were herbivores. But she froze when a black silhouette blocked the light from the quarter moon and stars above. Slowly, very slowly she wrapped herself in a blanket of filaments and hid in the very algae that her own food was eating. Would that be enough? Her night vision was sufficient to see the moonlight glint off a row of snaggleteeth in its lower jaw. The bane of her kind, this monster was a carnivorous fish called a coelacanth (SEE – la – kanth). She was small – not even a snack for that beast. Nonetheless, Tentacles knew that hunger would drive it to eat anything. She waited a long time after it had vanished in the darkness before releasing her grip on the greenery. Today had been the most difficult in her young life: a terrible storm and a horrible fish. She had taken refuge beneath deadly coral tentacles and survived. Life was not easy in the Devonian Period. Tentacles hoped that hers would be long enough to mate and release her own eggs for the next generation. Who was Tentacles? She was a type of mollusk called a cephalopod, which means “head – foot” because the tentacles or foot-like appendages were attached to her head, surrounding her mouth. Millions of years later, they would be called nautiloids – squid-like creatures related to Pearly Nautilus. During the Devonian, they were the dominant predator, after the newly evolved fish. In her sea, there were carnivorous fish around, but they weren’t abundant. Devonian cephalopods are very rare in limestone deposits. They swam and weren’t easily buried by storm debris. Why was Tentacles given that name? List two Devonian animals capable of eating Tentacles. What did she like to eat? How did the storm affect her? 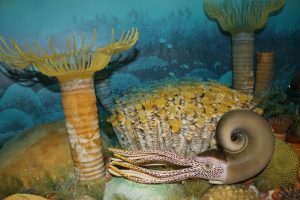 Why are Devonian cephalopods rare as fossils?